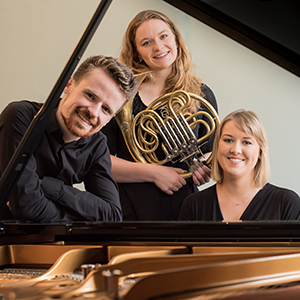 Trio Solas comprises tenor Philip Keegan, French horn player Hannah Miller, and pianist Éadaoin Copeland. The three Irish musicians have been performing together in various combinations for many years since meeting in the Royal Irish Academy of Music Symphony Orchestra, where Philip and Éadaoin sat as desk partners in the viola section! Since forming Trio Solas, performance highlights have included recitalsin St.Ann’s Church, Dublin, St.Iberius’ Church, Wexford as part of the Music in Wexford Summer Series and Holmpatrick Church, Skerries. Born in Wexford, Hannah Miller began her horn studies with Sue Furlong and later Liam Daly. She studied on the Bachelor programme in Royal Irish Academy of Music with Fergus O’Carroll and completed an Erasmus Exchange in Sibelius Academy, Helsinki with ErjaJoukamo-Ampuja. At just 21 years old, Hannah was appointed Assistant Principal French Horn in Kuopio Symphony Orchestra in Finland. She has also performed with TapiolaSinfonietta and Helsinki Sinfonietta in Finland, and with Kirkos Ensemble and Crash Ensemble in Ireland. As a soloist, Hannah has performed with Dublin Consort at Dublin Brass Week, with TapiolaSinfonietta, and Wexford Sinfonia in the National Opera House in Wexford. Having recently graduated with a Bachelor’s degree from the Sibelius Academy, Hannah is currently studying her Master’s degree at the Juilliard School of Music in New York. Philip Keegan recently completed his Music Performance degree at the Royal Irish Academy of Music, where he received the Briscoe Cup, awarded for the Outstanding Student of the Year, studying with Lynda Lee and Dearbhla Collins. He has performed extensively with various performing groups within the RIAM, with leading roles in the World Premiere of ‘Vampirella’ by Siobhan Cleary, the RIAM production of The Magic Flute and Monteverdi’s ‘Tirsi e Clori’. Philip recently performed Brian Boydell’s Feather of Death song cycle with the Contempo Quartet and Bill Dowdall in the Royal Irish Academy of Music, and Gounod’s ‘MissaSolemnis’ and Mendelssohn’s ‘Lauda Sion’ as tenor soloist with Wexford Festival Singers and members of the Wexford Festival Opera Orchestra. He also sang as the tenor soloist with the Carlow Choral Society and the City of Dublin Chamber Orchestra and with St. Cecelia Singers, Bray Choral Society as well as the with the Royal Irish Academy of Music chorale. He was chosen to participate in the Camerata Ireland Music Academy 2017, where he received masterclasses with AilishTynan.Philip is a multiple first prize winner in the FeisCeoil as a tenor, violist and pianist. A strong interest in the English Song repertoire led him to win the English Song Prize Award in the Irene Sandford Competition in 2015 in the Royal Irish Academy of Music. He was recently awarded the prestigious Trench Bursary award. Éadaoin Copeland is an Irish pianist currently based in Amsterdam where she is studying in the Conservatorium van Amsterdam for a Master’s Degree in Répétiteurship. She studies under the tutelage of Frank van de Laar, Jaap Kooi and Marianne Boer. Éadaoin previously studied piano for many years in the Royal Irish Academy of Music. She holds a first-class Honours Degree in Neuroscience from Trinity College Dublin and a Diploma in Piano Teaching and Performance from the RIAM. Éadaoin performs regularly in recital both as a soloist and instrumental and vocal accompanist in Ireland and across the Netherlands. Recent recitals include Thomaskerk, Amsterdam, Papagenohuis, Laren, and Cultureel Centrum Onder de Linden, Middenbeemster. She has also performed live on Dutch National radio NPO4 and BBC Radio 3 in the UK. Previous collaborations include being pianist for ‘Drums and Guns’, a project involving the RIAM, Guildhall School and Juilliard with performances in Dublin, London and New York, and as répétiteur in the Guildhall Opera School summer programme in Fontainebleau, France. A musical highlight for Éadaoin was performing Schumann’s Piano Concerto with Trinity Orchestra in Dublin and Prague. She has participated in both solo and collaborative piano masterclasses with acclaimed pianists including Leon McCawley, Robert Kulek, Iain Burnside and Jeff Cohen and is a multiple prize-winner in various competitions across Ireland. Éadaoin was the recipient of the 2016 Orla Boylan Young Musician Bursary, and her studies in Amsterdam are kindly supported by the Arts Council of Ireland and Fingal County Council’s Artists’ Support Scheme.